I need some opinions please!! Melville Matsuri is happening very soon and we are getting busy to sort things out. 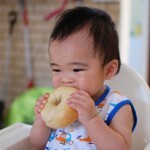 Food seems to be the high interest for people, as I received several questions about food. 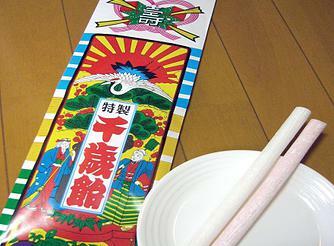 What food do you expect to see at the Japan-themed festival? So far, we have Takoyaki, Japanese curry, Japanese-style sausage sizzle, Rice balls, Rice burgers, Japanese cakes, Japanese sweets Wagashi, and Kakigouri (shaved ice). Do you think they’d be enough? 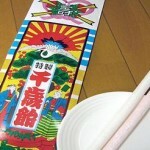 In Japan, people expect to see Takoyaki, Yakisoba, Okonomiyaki, Crape, Grilled squid (Yakiika), Grilled corn (Yaki-toumorokoshi), Kakigouri … so on… I wish there is a stall selling Yakisoba at Matsuri but so far no Yakisoba. Anyway I hope the event will be a successful one! 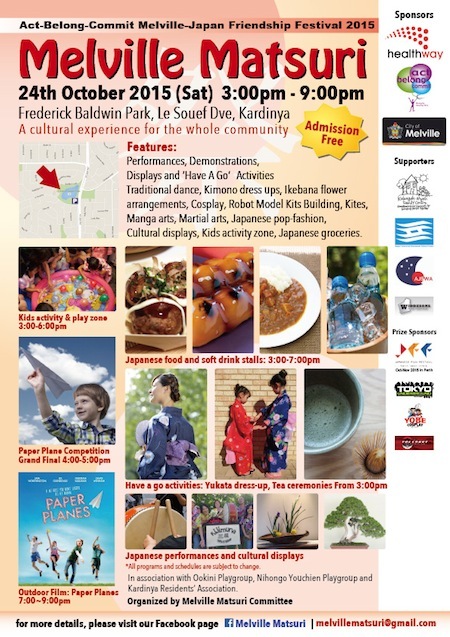 Finally, a flyer for Melville Matsuri is ready ! 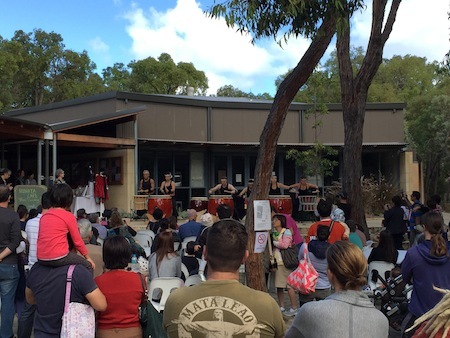 Melville Matsuri is a community event for all ages to experience all aspects of Japan. I’m very happy with how this event is forming – lots of activities ! 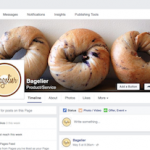 Check out our Facebook pages, and don’t forget to LIKE and SHARE with friends! 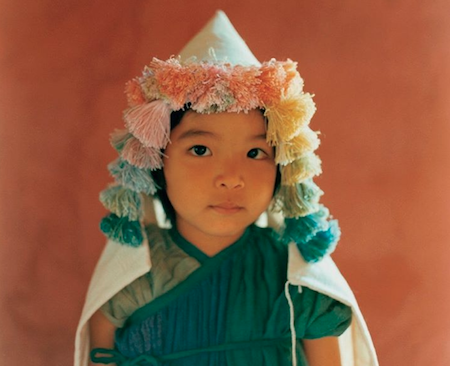 Kitta is a Japanese artist who lives in Okinawa in Japan, and she creates beautiful fabrics and clothes dyed using natural Japanese techniques. 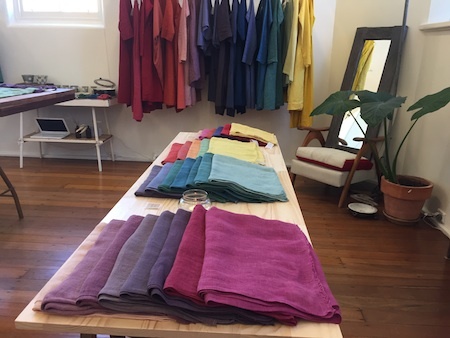 She is temporary visiting Perth now to carry out rare natural dyeing workshops using Japanese dyes such as Ryukyu Indigo, and also exhibit some of her beautiful works at Poteau in North Fremantle. The whole exhibition place was set up beautifully. 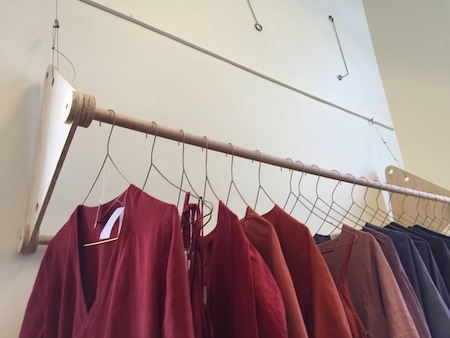 I was really amazed to see how beautifully you can dye fabric using natural materials. 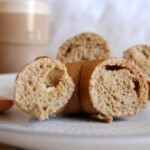 Everything was made from scratch by Kitta. 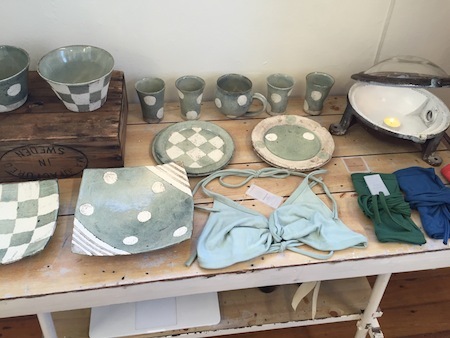 There’re dress, skirts, some fabrics, socks, sarongs, etc created by Kitta, and also some other artists’ kitchenwares available to purchase at the exhibition. Everything was natural-themed, and even these wooden rails were handmade just for this exhibition. I tried on some of the dresses. They were really comfortable to wear, and the colour was so beautiful. I also loved the uniqueness of the shape. Everything is one of a kind. Kitta will be in Perth for another few weeks only and once she is back to Japan there is no way to purchase her work (she doesn’t even sell online), so if you are interested please visit her exhibition. This exhibition is organised with the assistance of the NGO Earth Network. There will be a free Japanese film shown at Hyogo Cultural Centre in City Beach this Friday. 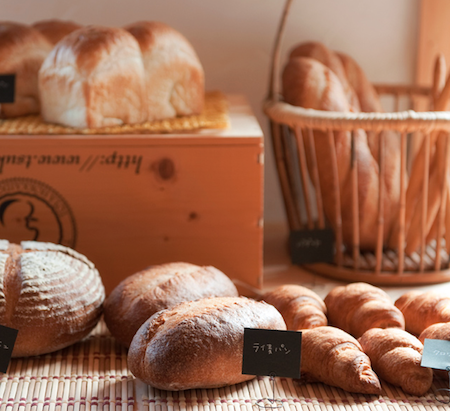 The film “Shiawase no Pan” (“Bread of Happiness”) is a 2012 Japanese drama film directed by Yukiko Mishima and starring Tomoyo Harada, Yo Oizumi and Kanna Mori. I love this kind of soft Japanese drama. There will be no admission fee, and some bread + drink will be provided to the visitors as well. 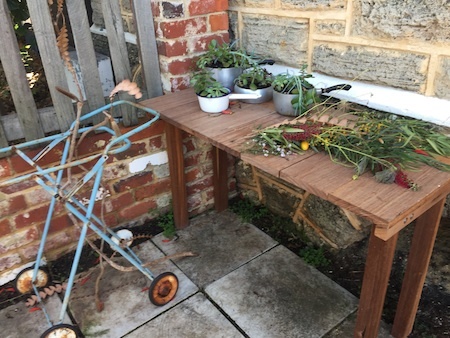 It’s August now and we are in the middle of winter in Perth. It’s cold, but I noticed the day is getting longer compared to few weeks ago. Spring may be just around the corner. As spring approaches, I’m getting busy for the preparations for an event which will be held on 24th October in Melville. I’m in a committee and in charge of kids activities. This event, recently finalized its name as “Melville Matsuri”, is a festival introducing Japanese culture and background to local people. It’s a charity event and there will be a lot of activities for all ages at a gold coin donation or even for FREE! and much more. 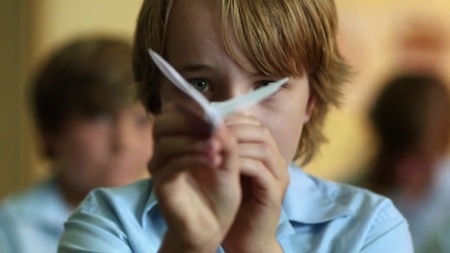 There will also be a grand final of paper-plane competition for primary school children in City of Melville during the festival. and much more. Lots of displays & demonstration featuring Japanese culture (bonsai, taiko performance, cosplay etc) too. And, of course, some yummy Japanese food & drinks!! The final flyer hasn’t been completed yet, but as soon as it’s done I will post here again. On the same month, there will be another Japanese event in City Beach. 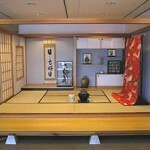 There is Hyogo Cultural Centre in City Beach, and Shichigosan ceremony will be held there on 10th of October. It’s a great opportunity for families with children aged 3, 5 or 7 who can’t go back to Japan but still want to cerebrate shichigosan. They can do it here in Perth. There will be some food stalls as well. I’m not in committee of this event, but I am planning to sell some food at the stall. 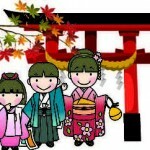 My children are 4 & 1 years old, and we are going back to Japan next year so we will be cerebrating shichigosan then – so I’m not attending this event with my family. I will update when it’s close to the date! Love another side of Japan? 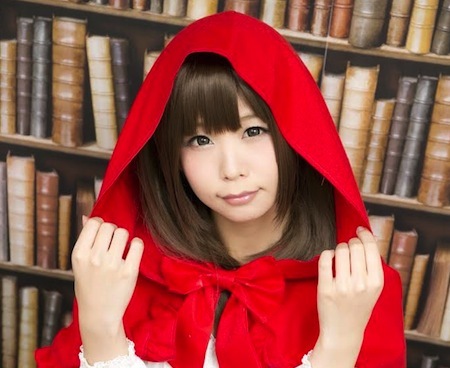 If you like Japanese anime, you may enjoy some cosplay experience. Personally I like cosplay! I wouldn’t do too much skin-showing, but I love to dress up in a totally different character. 🙂 That’d be fun! 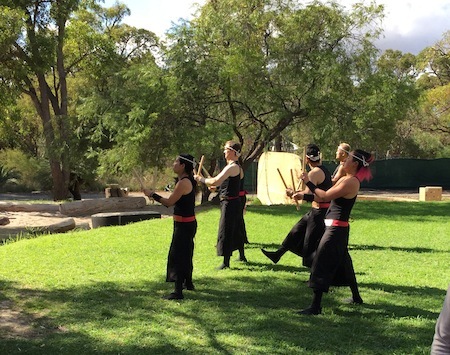 There was a cosplay show at Japan Festival (I wrote about this festival here and here), so I know there’re some cosplay-lovers in Perth too. For some people, cosplay may sound wicked, but I bet everyone has dreamed about being someone else once? Kids cosplay is so cute. 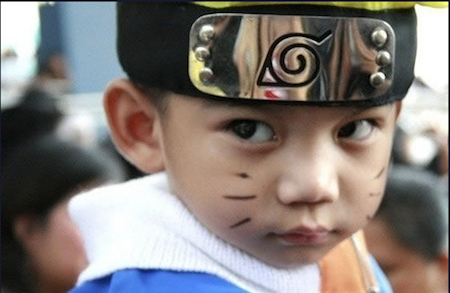 On 22nd August 2015, there will be Japanese Pop-culture introduction workshop in City Beach where you can experience the cosplay world and also get some tips about how and what. There will also be a workshop for Manga drawing as well. I remember drawing manga when I was a teenager :p I was so into it and I still like drawing. 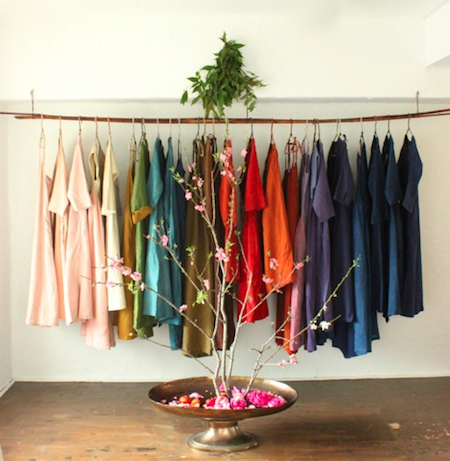 At the workshops, you will be experiencing her world of “colour” dyeing. 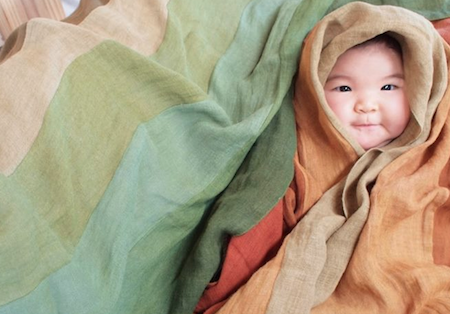 It is a Japanese method of dyeing, and is truly unique and beautiful. You can choose to create a Dress, a Wrap-around Skirt, or a Bag. 10:00-Meet at Pollard Designs studio. Bush walking to see nature color in the bush. 11:00-Start making color vat in the fire. 13:00-Explanation of the process of dyeing. kitta’s slide show and Sawa’s guitar performance. 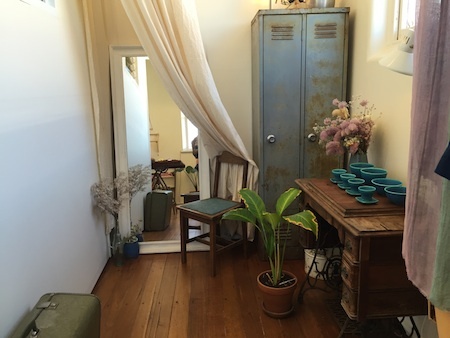 ●$300 for 2 days workshop including Japanese style lunch, materials (wrap skirt ,dress or bag ), tea and coffee. Kitta Exhibition opening is held on 15th August. I’m sure you will have a beautiful experience over these two days!!! 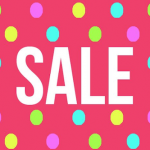 Please note there are only 3 seats left for the workshop… secure yours now! 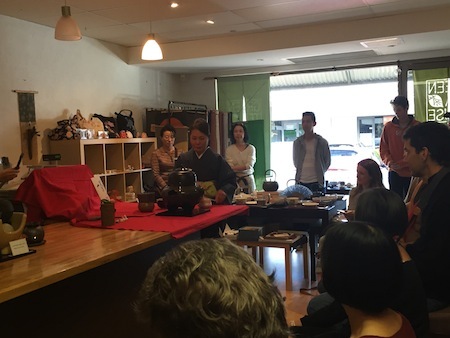 There were Japanese tea ceremony sessions at Green Tea House in Subiaco today, and I headed there to experience my first ever cha-no-yu (tea ceremony in Japanese). I must say it was a great experience and that 30 minutes gave me a special feeling – surrounded by Japanese instructors and people who have interests in Japan – I felt warm and was reminded what special culture and tradition my home country has. I didn’t expect to see this many people at the session today. Some people had to stay stand-up for the whole session. 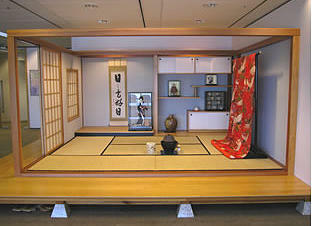 Tea ceremony is normally carried out where people sit down, but they used chairs due to the height of counter table in the shop. It was actually my first time to come down to this shop. 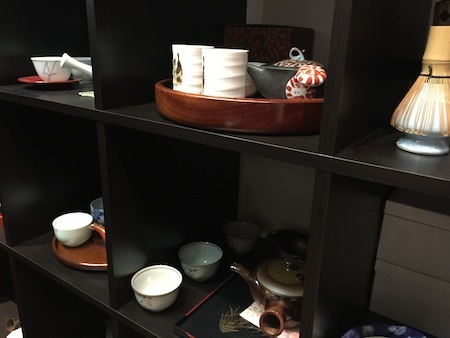 There’re many beautiful Japanese tea cups, tea pots, plates, kitchenware and ornaments sold at the shop. 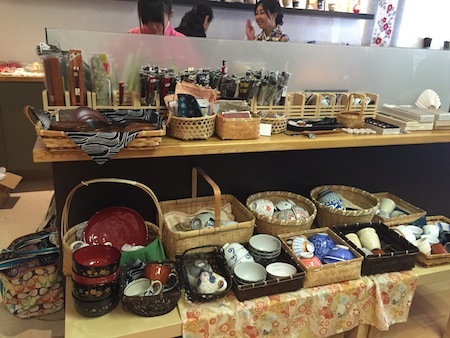 They are very well-made (not cheap ones like you get from Daiso) yet the prices are really reasonable. 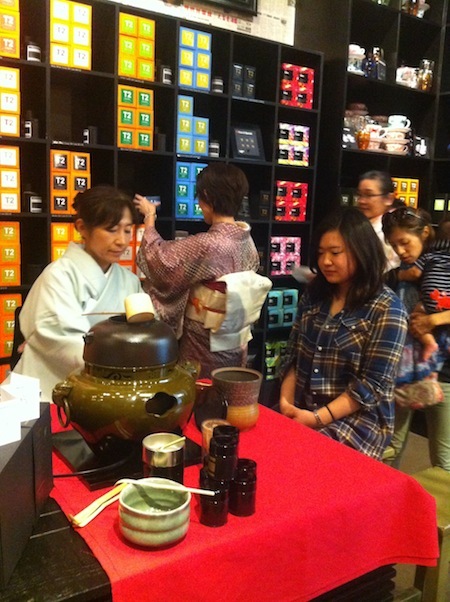 The tea ceremony started. All the guests were focusing on the host’s movement. Wagashi (sweet to accompany bitter green tea) was served to each guests. Tea was served. Made one-by-one. The wagashi was quite sweet to balance the bitterness of matcha green tea. I’ve never had matcha green tea prepared in a proper manner like this. I imagined the tea would be very bitter but it wasn’t that much. 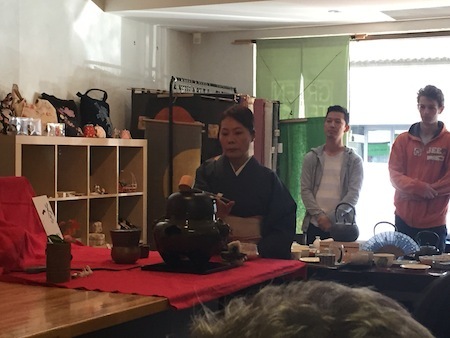 As I was told by the instructor, I raised the tea bowl (to show appreciation to the host), turned the bowl half way in clockwise, then drank it. I really liked the tea. I was imagining, in old time in Japan, people were drinking tea like this, and tea time was very special moment. The whole ceremony reminded me of beauty of Japan. As soon as I got home I called my mum and asked if she still have kimono in Japan. 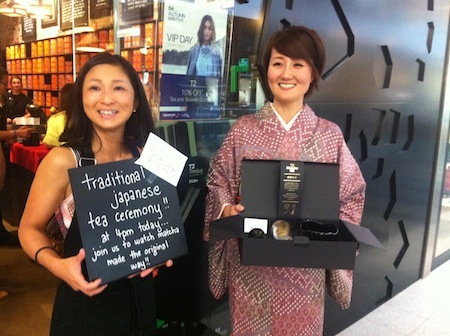 I will bring some kimono to Perth next time I fly there!! 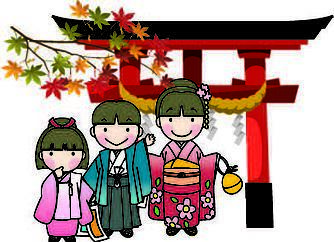 Kimono is very expensive, and it’s such a waste if not worn ! 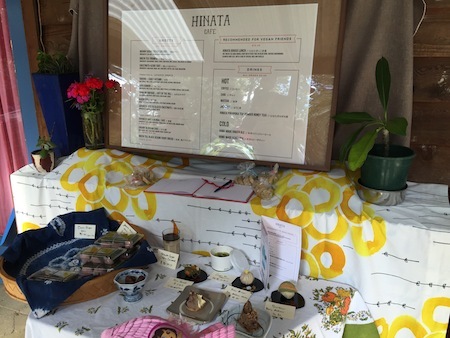 Hinata Cafe was held last week with lots of visitors experiencing rich feast of Japanese culture, craft and food. I was bit worried about the weather but it became such a lovely day. Luckily I could be there from the beginning and could enjoy taiko performance. 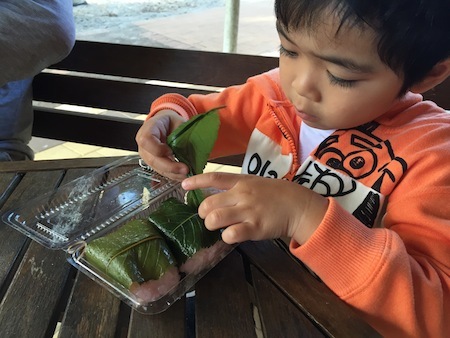 I loved the food at the cafe – people were so nice and working hard to serve warm healthy Japanese cafe food… My son had sakura-mochi (kashiwa-mochi had been sold out already!) 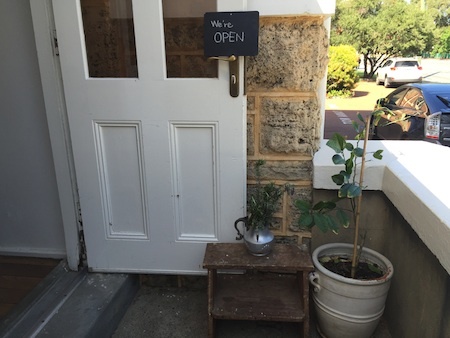 from the cafe. I told him he can eat the sakura leaves too but he peeled the leaves off :p I guess the leaves were too salty for him. I enjoyed takoyaki and hand-made juice there. 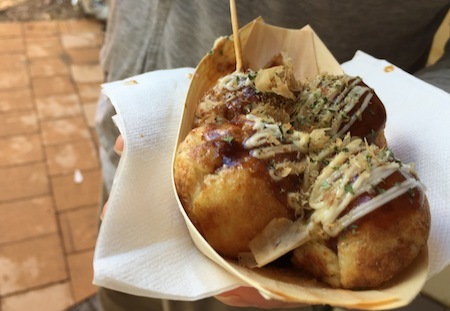 I thought the takoyaki was much better than the one I had at Japan Festival in CBD few months ago. Matcha – finely ground powder of specially grown and processed green tea – is known as one of traditional Japanese tea and I get to see lots of “matcha” products everywhere in the world such as matcha ice cream, matcha latte (I miss it!! 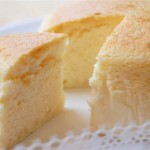 ), and matcha cheese cake, just to name a few. However I don’t think many people actually know what matcha really is and how real matcha tastes like, and especially how to prepare and drink matcha. Do you? Well, guess what. I actually do not know how to prepare matcha (even though I’m Japanese!) in the way it’s supposed to be, and I don’t think many Japanese people do either. 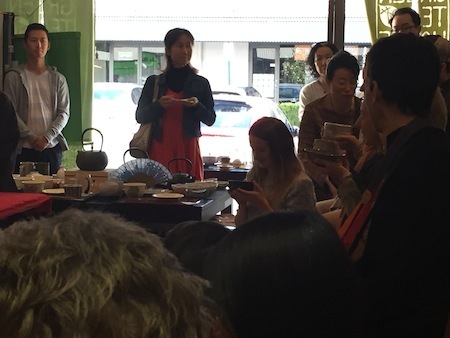 So it was not a surprise for me when I was told that some staff at T2, one of Australia’s largest tea shops, did not know what to prepare and drink matcha. 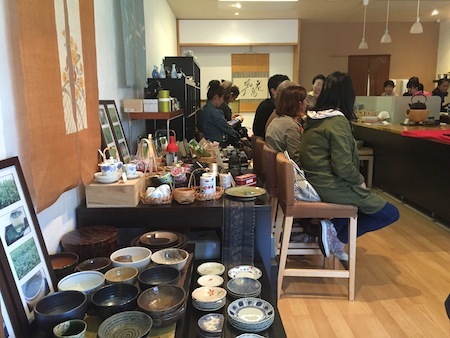 Nowadays you will need to go to some class to learn sadou (茶道 : the traditional etiquette of preparing and drinking tea) if you’d like to learn how to prepare matcha. 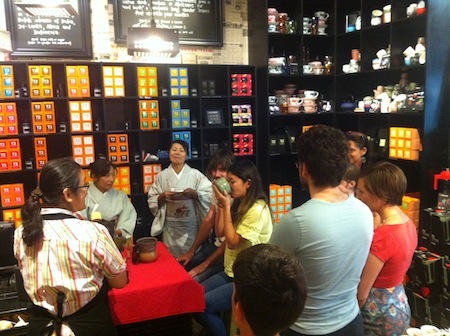 Eisetsu-san, a Japanese tea ceremony instructor who lives here in Perth, approached T2 after seeing 2 jugs of matcha green tea at their tasting counter – one was matcha x lemonnade, and another was matcha with some cut fruits in it. Well, you probably can drink matcha like this and it could be an “Australian style” or a new way of drinking matcha, but it was far from matcha’s original method of drinking. 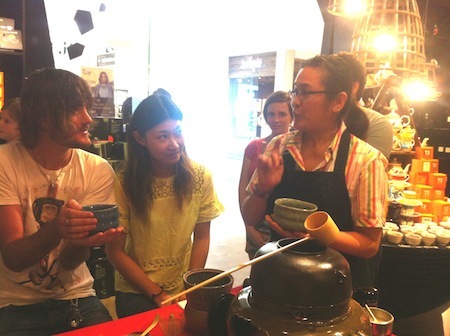 Drinking matcha actually involves preparation as well, and Eisetsu-san wanted to introduce Perth people the whole process of matcha making. She is also receiving some offers from high schools and university for demonstration. 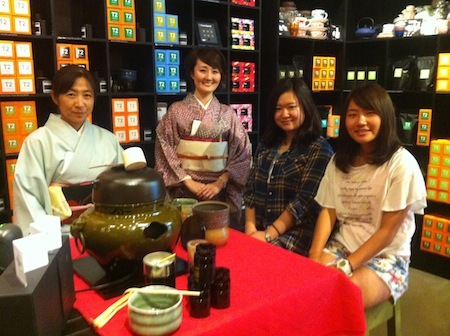 If you have interest in sadou (茶道) – Japanese tea ceremony -, please contact her. 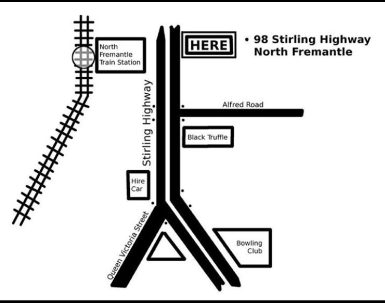 She runs classes on occasional bases in Perth (which I’d like to join in future).